Factual error: Morrison did finish film school in real life. He did not drop out as depicted in the film. Factual error: During the scene where Morrison is sitting on the ledge of a building and drinking, you can see a billboard advertisement for a film below him on the street. Even though this scene is set around 1969, the ad is for the Eddie Murphy-Nick Nolte film, Another 48 Hrs. Continuity mistake: After the New Haven gig in which the captions tell us is in "1968," Jim Morrison is arrested. On his mug shot photos, the date given is "12-15-67." Continuity mistake: During the Miami gig directly after Jim exposes himself and mayhem breaks out, it is as clear as daylight that the stage collapses and all of the speakers, band equipment, etc is rendered useless. A few seconds later though, Jim is walking through the crowd singing "Break On Through" with backing live music as if the band was still playing up on stage. Jim is also using a standard wired microphone, which he could not have walked all around the venue through the crowd with. Continuity mistake: During the Thanksgiving scene, Pamela chucks a spoonful of sweet potatoes onto Jim's face. But as Jim chases her around the dining room his face looks scrubbed clean. Continuity mistake: During the Miami 1969 gig, mid-song into "Five To One", Jim swings the microphone around over his head and hits one of the venue promoters (who we had seen a few minutes earlier, stating "There's gonna be a show here tonight or I'll throw a wig on and sings those songs myself") in the head. Other shots during the beginning of the show have the promoter nowhere near the stage area where he could have been hit. Secondly, Jim's microphone chord would have to defy logic in several ways ANYWAYS to hit the promoter, even if he were close by, without first striking at least a few other people, or other things. Continuity mistake: At the San Francisco 1968 gig, during mid-song of "Not To Touch The Earth", Jim screams into the microphone and then dances around and apparently starts hallucinating to the visions of American Indians and such on stage. The camera pans to organist Ray Manzarek, who is staring and seemingly off-struck watching Jim. The organ and rest of the band are still playing, but during this shot Manzarek is not playing the organ. Continuity mistake: When Jim is in Patricia's apartment he wraps a tablecloth around his waist as he runs around the bed, and it's obvious that he still has it on when he jumps on her. But in overhead shots the tablecloth is gone, isn't even near the bed at all. 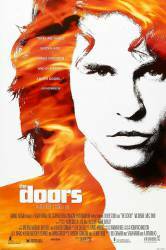 Other mistake: Early in the film, before they were signed to a record deal the Doors were playing small clubs around L.A. in 1966. After one of these gigs, a promoter comes up and asks Jim Morrison how old he is, in which he replies "21." Morrison was born in 1943, so the youngest he could have been is 22, not 21. Character mistake: In the scene before the New Haven concert, when Jim is talking with the reporter/ love interest about his school history, she comments that Jim attended the University of Florida. In actuality, Jim attended Florida State University.